The markets of Paris are worth a visit at any time of year — but they’re particularly magical during the holiday season. Turn any corner in Paris and you’ll find world-class boulangeries, cheesemongers, chocolatiers and butchers. 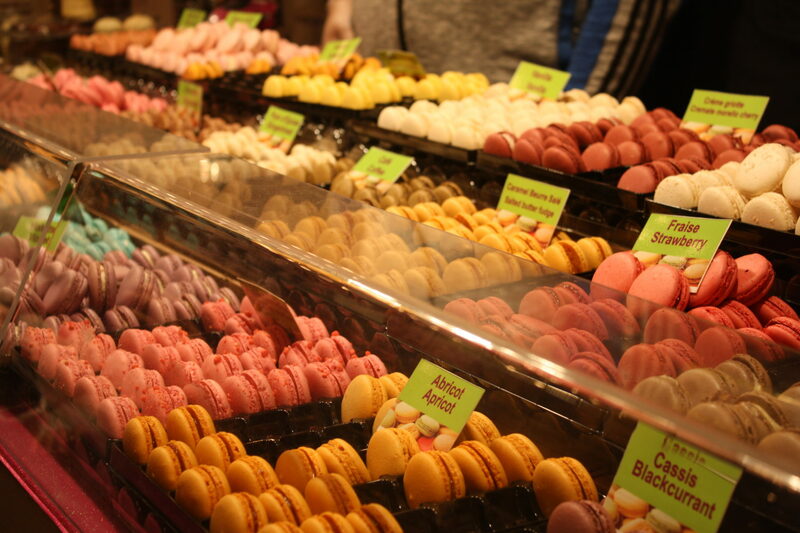 But for a truly memorable Parisian shopping experience, you’ll want to visit one of the city’s outdoor markets. While most of them operate year round, an extra-special crop of holiday installments pops up in December. The most famous markets are located near Notre-Dame Cathedral and the train stations — but my favorites are the smaller neighborhood versions. Turn a corner or enter a square and you’re greeted by a charming scene filled with lights, music and revelers. Here are my five favorite local markets where you can browse souvenirs, pick up a hot mulled wine and enjoy! No trip to Paris is complete without a visit to the famous Marché Bastille. Stretching between the Bastille and Richard Lenoir metro stations, this open-air market boasts more than a hundred stalls brimming with everything from fresh fruits to free-range chickens to African batiks. The food market is open on Thursdays; on Saturdays, a craft market called the Marché de la Création Bastille offers inexpensive artwork and handmade trinkets. The Marché des Enfants Rouges, in Marais, has plenty of standard market offerings, including displays of sumptuous looking fruits and vegetables. But prepared food is where the oldest covered market in Paris really shines. Located not far from the Seine and operating since 1615, this market harbors some surprisingly good Moroccan food at Le Traiteur Marocain. Don’t be scared off by the line; the rich tagines are worth the wait. Other great options include bento boxes from Chez Taeko and sandwiches from Chez Alain Miam Miam. The Marché des Enfants Rouges is open every day except Mondays. Be sure to save room for dessert. The macarons from Pierre Hermé, situated across the street from the Marché des Enfants Rouges, come in inventive flavors like rose petal, white truffle chocolate hazelnut, caviar and chocolate foie gras. Get two markets in one destination at local favorite Marché d’Aligre. This expansive covered shopping hub offers a wide range of stalls stocked with meats, cheeses, seafood, wine, beer and more. In the morning, it spills out into the streets, where vendors hawk home goods, fabrics and antiques, along with the regular food offerings. The Marché d’Aligre is open every day but Mondays. Stop for refreshment at the nearby wine bar Le Baron Rouge. This friendly neighborhood haunt offers pours of various wines for three or four Euros each, or you can fill up a bottle from the in-store casks-to-go. A cart out front sells fresh-shucked oysters by the half dozen on Friday and Saturday nights. 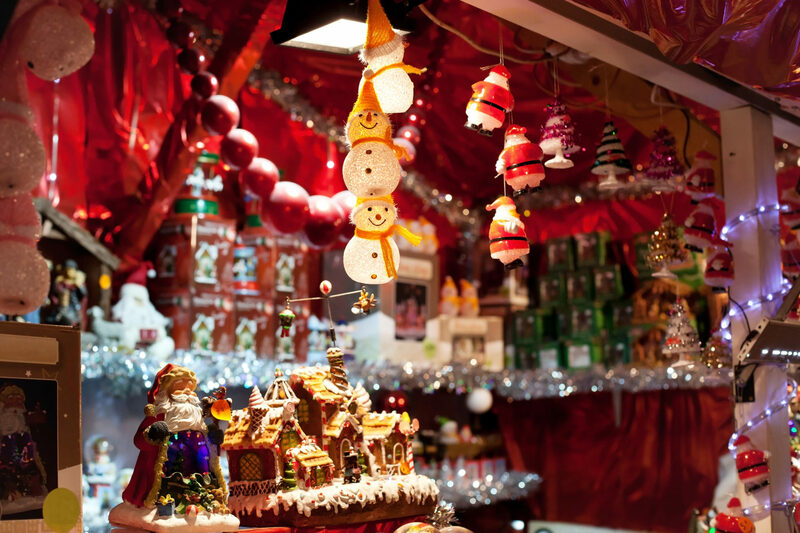 Paris teems with holiday markets during the month of December; nearly every corner of the city opens into a square of cute wooden chalets serving hot cider or gingerbread or raclette, a rich Swiss delicacy of melted cheese scraped onto sandwiches or potatoes. One evening, I stumbled across one such charming market — the lively Starry Christmas Village (Noël dans les étoiles) — not far from the Centre Pompidou, in Les Halles. 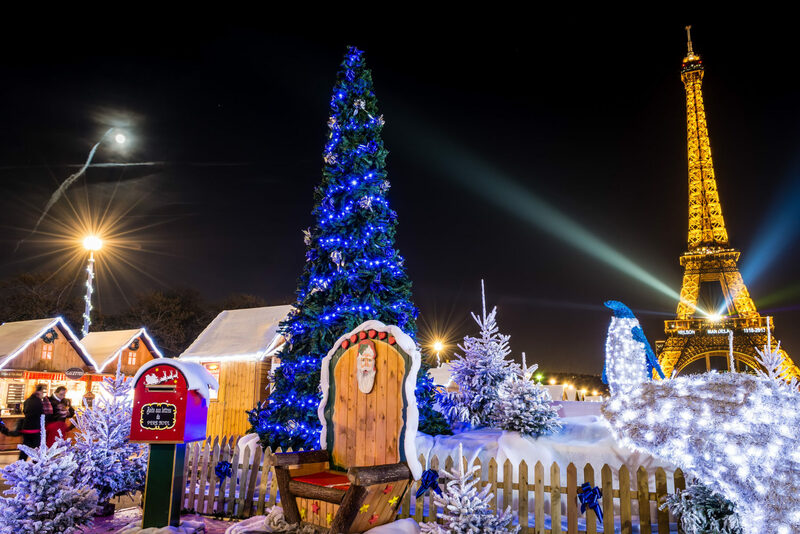 The newest holiday market in Paris, it features more than 70 chalets doling out delicious cheese, sausage and foie gras (to sample or purchase) and hosting craft sellers, live entertainment, an Enchanted Forest setup for kids (seasonal light projections included) and Santa’s abode. Some of the larger markets, such as the one at the Champ de Mars, feature extra treats like ice skating beneath the Eiffel Tower. The city also offers Norwegian, Italian, Swedish and Japanese-themed markets, as well as a vegan outpost in Montmartre. Where better to soak up the holiday spirit than in the shadow of the historic landmark? 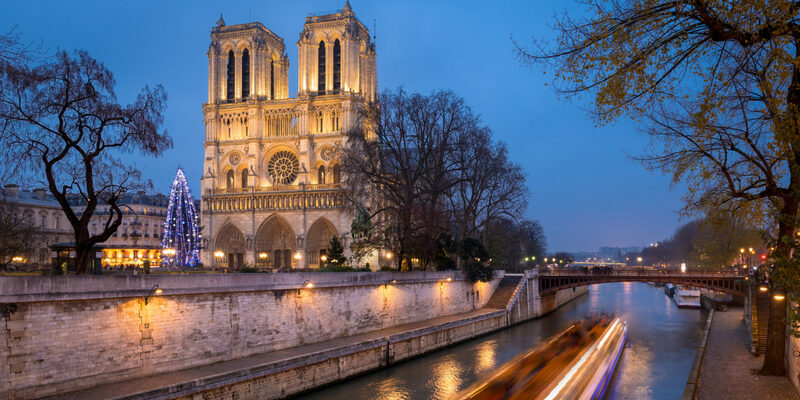 Located just across the river from the Ile de la Cité in the Latin Quarter, the famous Notre-Dame Christmas Market sets up shop in the Square Viviani. It runs for just over a week, opening 10 days before Christmas and closing on Christmas Eve. An astonishing array of vendors sell everything from ceramics to leather goods and jewelry to decorative ironworks, along with food, drinks, and, of course, mulled wine. 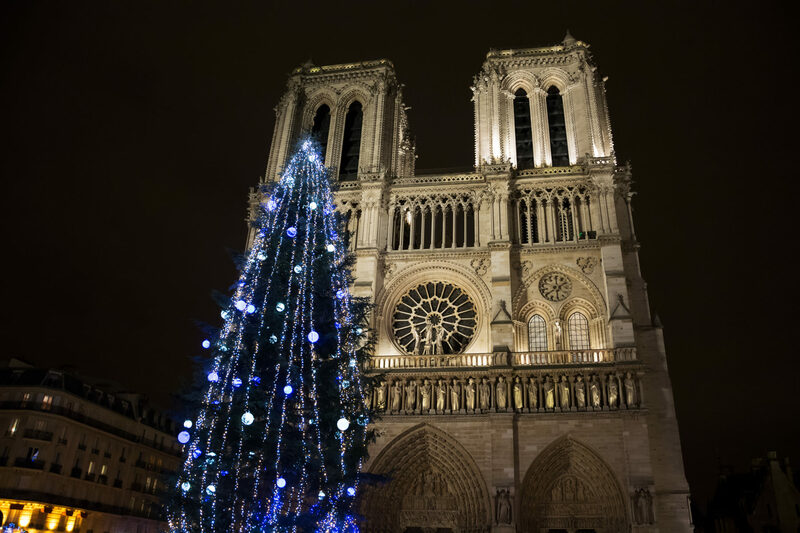 Grab a cup and revel in the magic that is Paris during the holiday season. If you want to go to the home of Christmas celebrations in France, visit Reims. French king Clovis and 3,000 of his soldiers were baptized in this Medieval town, which is now home to an impressive holiday market, as well as some of the finest Champagne houses in France.